Ted Mac “Gyv” Her finds his way out of a rocky ravine. Jeremy blasts his way through hero sand. Somehow Tom “The Kid” Smith survives this. 007 status granted. Team CanUK, consisting of Ted, Tom, Jeremy, and Tyson spent 3 days riding in the Mojave desert outside of Los Angeles over March Break. The goal was to get some desert training in preparation for their upcoming trip across Africa. After the problems I had in Bolivia riding over sand (see below), I thought it would be good to learn some techniques for riding over difficult terrain (e.g. sand, rocks, up and down steep slopes, etc.). I discovered AdMo Tours, and their dirt bike school, on the internet. When I learned that the owner of the company was none other than Uwe Deimer, a man who has ridden his motorcycle around the world (including across the Sahara alone and unsupported) I thought we could benefit enormously from spending some time with him. I was right. Not only did we learn way more than I could ever have anticipated about riding dirt bikes, Uwe had a wealth of information on adventure motorcycling in general and traveling in Africa in particular. 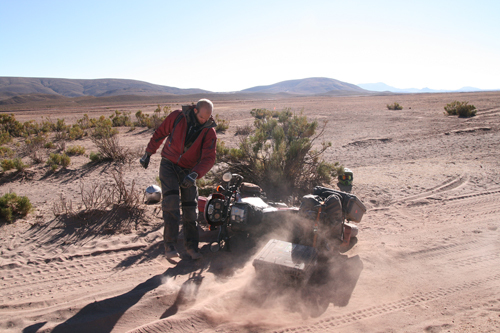 For example, we have decided to go with a GPS unit on Uwe’s advice. He also showed us some tools that were shockingly light. In addition to his practical advice, Uwe also entertained us with great (and sometimes harrowing) stories from his adventures. 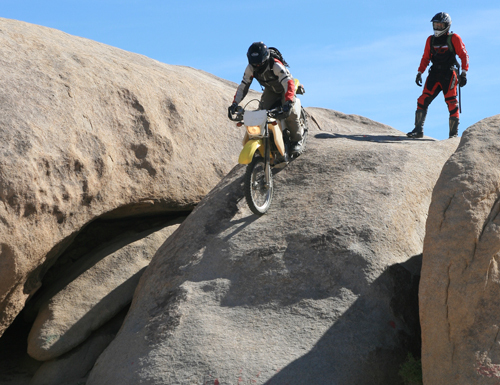 We did two days of training, followed by a full day of riding in Johnson Valley on day 3. Day 3 was among the best days I’ve ever had on a motorcycle. Over and over again I had to remind myself that it was actually me that was flying over the sand, rocky whoops, granite rock formations, and up and down steep hills littered with loose rocks. I felt like I was in a video game as I sped across the open desert dodging bushes, boulders, and Joshua trees. I was amazed at how much we learned in just a few days. I didn’t think I had it in me. I’m sure the fact that I was on a relatively light (compared to a fully loaded KLR 650) Suzuki DRZ400 helped immensely on the challenging terrain. 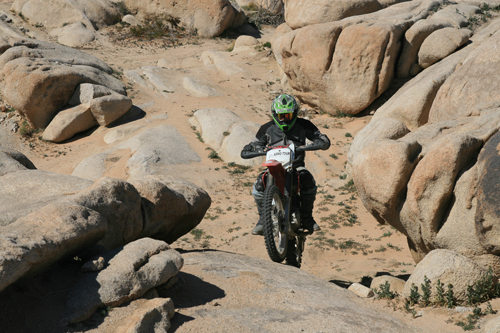 However, I believe that now that I know the correct approach to riding the various types of terrain that I encountered in the Mojave desert, I should be able to apply it to riding my KLR (with some practice of course). This picture was taken in Bolivia’s Altiplano about a half day’s ride north of the Salar. 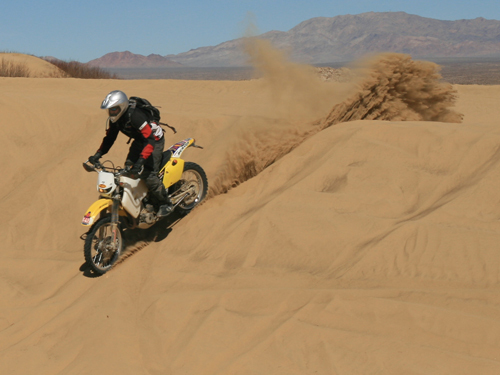 I rode through Bolivia fighting the bike and the sand. This was my third drop of the day. 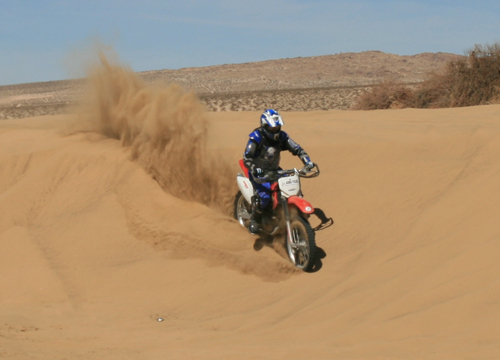 Now I know that the throttle is my friend in the sand and to keep the front end light and let it weave. And for the love of God stay out of first gear! I have a feeling Bolivia would have been a lot easier had I known what I know now.